" Thank you for this STAR RECRUITMENT! " The themeparX Construction Board has ALL your potential clients on-site, many of them silent readers. Over 100,000 (!) visitors have left their email with us, so we know who is watching. 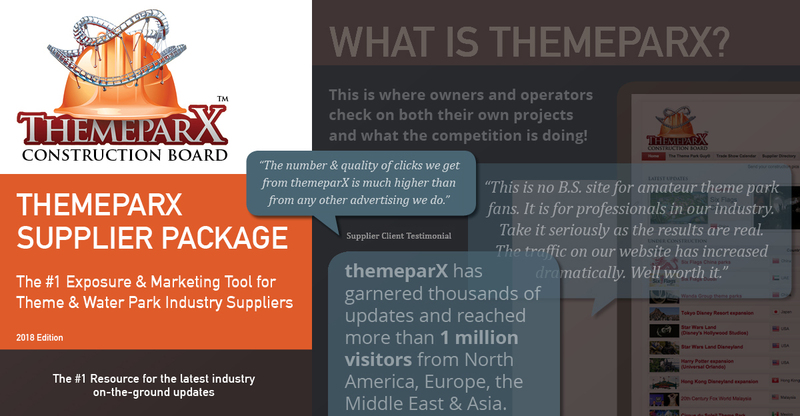 With a themeparX™ Supplier Account you will receive an entry in our #1-ranked Supplier Directory (now the world's most visited; prepare for 100k impressions) which includes being credited & linked from the projects you have been involved in, an SEO-power link to your corporate page and a very visible, huge ad which runs and rotates throughout all our 900+ pages. Learn more here. Email us and ask for more information! We will get back to you within 24h. I get over 100 emails per day. To ensure we get the opportunity to speak, please do send a quick message first, then call. US$5,000 retainer + 1 month's salary commission. Very reasonable. 50% of the retainer will be refunded in the (very unlikely) event no matching candidate is found within 7 days. US$1,000 inital consultation fee (includes 2 hours in person, on the phone or on Skype), thereafter negotiable. Please understand, there is no free initial consultation. I know thousands of theme park professionals in person and can perfectly point you to the right people for your project. Please refer to the consulting fees above. Free for publications reaching 1M. Otherwise US$1,000 flat rate + US$500 per picture. The gargantuan UAE theme park bubble will soon suffer a sudden stroke. my parents visited last week and said all the parks were completely dead. Interesting to see how it pans out. @themeparX is this just a prediction? Do u have numbers and figures to support this statement? Is that based on anything other than guessing ? by a new park ? IMG?